You are here: Home / Soccer Mind Podcast / Does Experience in Soccer Equal Confidence? 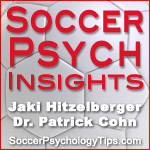 Welcome to episode 5 of Soccer Psych Insights, your soccer mental training podcast. On this episode, Jaki Hitzelberger, MA, MGCP and Dr. Patrick Cohn answer a question from a soccer player who says, “I have a big lack of self-confidence in my game. I’ve played at a very competitive club level since I was 9 and I’m now 16, I should have confidence in myself. What should I work at to get that confidence up? Jaki Hitzelberger and Dr. Cohn answer this question and talk about what hurts confidence in soccer. They discuss how to have stable confidence that is based on years of experience in soccer. Listen to this episode to learn how to improve your confidence and performance in soccer.